Like many other bloggers, I adore Heather Chadduck, and even though she did this bedroom like 8yrs ago or so, I still adore it! I wanted it, so of course I copied it! So many posts went into the making of this room! I first started by painting the walls Benjamin Moore’s In Your Eyes and then purchased some cabbage rose fabric from Joanne’s and some cheap linens. However, the duvet was an Anthro splurge that I just had to have! 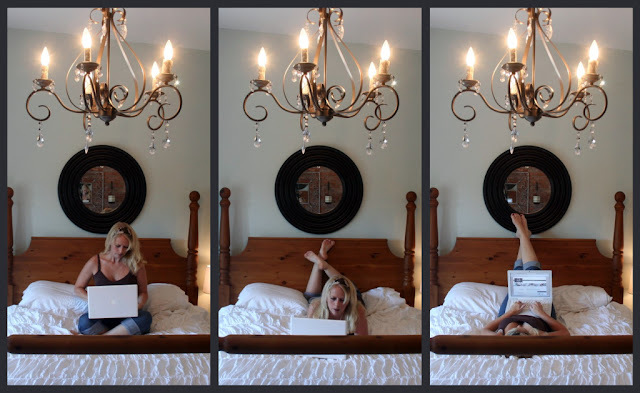 To see how I created the wall art for my bedroom click here. To see how I made a “cheater’s version” ruffle pillow click here. For a tutorial on my mistreatments, click here. And to see how I transformed a $10 Craigslist chandelier into this beauty click here. I hope some of you will become Google Reader followers so that you’re sure not to miss out on all I have planned in 2011! 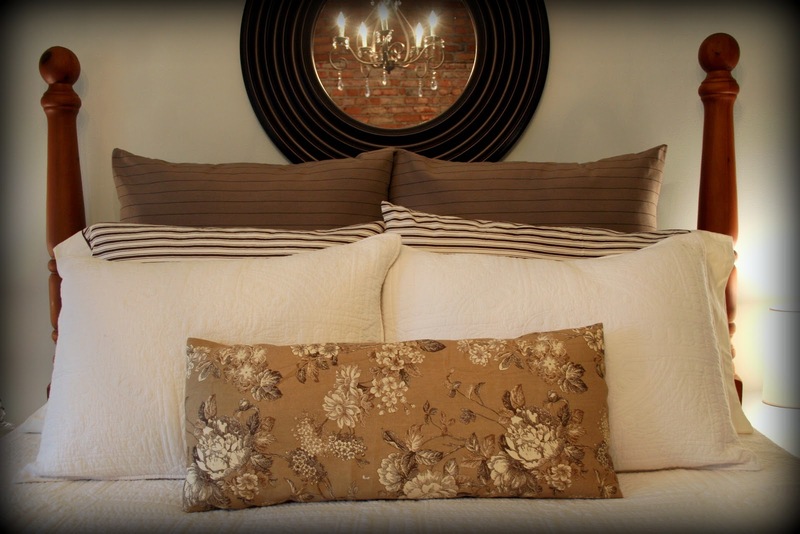 I love that shirred coverlet you have on the bed! Did you make that? I'd love to have one! This room is gorgeous! I really love the idea of finding an inspiration photo and copying it in your own way. When I finally get around to doing our bedroom, I'm going to take that excellent advice. I'm really late to the game, but I would paint the dresser white or the blue of your walls. Of course, that would require you to work with the awful blue again, but maybe you could color match? Anyway, I'd personally probably go with the white. Love the room! We're having some new bedroom pieces delivered tomorrow a.m. and this is just the inspiration i needed. i would paint/distress the dresser in black also. it looks like the great WalMart mirror over the bed is black, right? I think that mirror needs to move up about 6-8 inches too. Is there room to swap out the cream dresser over to the right side of the bed and move the small table and great door to that corner? i feel the need to run out and search for those doors right now! Thanks for posting and enjoy! Sigh. I forgot how much I love your brick walls. Your "imitation" is amazing! And what great deals! You did a great job! love it all.. especially those brick walls … just yummy! happy holiday!! oh my gosh!! I am new to your blog (via Thriftydecorchick) and i am in love!! Your bedroom is amazing, as is pretty much everything else. You are definitely going into my favorites! I'm going back through all of your old posts! Can you tell?? Hey the oldies are goodies and they want love too!! Ok love everything, the brick wall is fantastic! The painted everything white is simply stunning!! Isn't it crazy what a little white spray paint can do!?!? And I'm sorry, but no TV!??! My husband would…. just melt away! I had to keep ours in our room but have a cutsie little cabinet for it! You did a great job! And I love exposed brick. I would place my bed against that wall. What a great focal point, either way. Very beautiful room! I am loving your exposed brick! Very beautiful calm and relaxing colors. awesome bedroom!you did a great job. 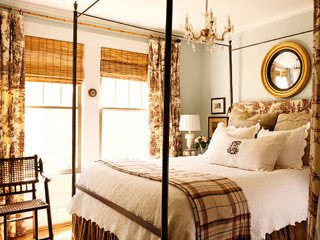 love the brown ticking pillows, your new curtains, and that window. what a relaxing place to lay your head! Beautiful. I especially just LOVE your 4 beach pictures. I could've sworn I already left a comment on this post, but since I don't see it here, I'll say it again–I love it! It's fun to see how it evolved and how you used your inspiration photo. I have that one in my files, too. So pretty! this bedroom is so peaceful to me. i love anything that heather chadduck touches. i think your room is beautiful with so many creative touches. thanks for sharing all the details. girl…you've been busy! You have done such a great job! I am looking for just the right chandelier to go in our master. The problem is I want to pay next to nothing for it. Love the brick wall too! Wow, you have such amazing talent! All for under 250? Is this truly possible? I am amazed and inspired. Thank you! Your room is gasp-worthy! I love your wall are – the frames with the eggs and such. I love love love them! And your lamps. The fabric. And can I tell you how badly I want to run to Gabes to see if I can find those brown mattress ticking pillow cases?? You truly transformed your space. It's gorgeous! I bet it's so wonderful to fall into bed after a long day. Great job! What a serene bedroom, I love it! How charming! What beautiful bedroom. Beth, I love your redo! I remember that Heather C. photo & have always loved it & figured you might have used it as inspiration & you did. Job well done, it's so pretty & soothing. And that brick wall is such a nice touch! beautiful! I think you can either leave the pine dresser as-is or to paint the same wall color. It will look awesome against your brick wall. It turned out so great. Now only if I could find THE inspiration picture for my bedroom. It needs work, Hard. There isn't even a before look, because it has no look yet. it looks really great, very peaceful and cozy. your bed is so high how do you not want to shove stuff under there! i try and keep mine to a minimum but glad it is covered! good job! and i am really in love with the inlaw dresser! while i do believe this new look is amazing, that first 'before' picture is AMAZING! the christmas balls?? i love it. i'm swooning over it. beautiful room. I have seen your inspiration picture on other blogs. I like your take on it. you used some of the ideas, but personalized it to you. Loving those curtains. Off to read how you made them. Your room is certainly inspirational! It's beautiful! Well, there you go again!!! Creating an amazing space with a great budget and lots of sweat and tears. It is so worth it. I would take that bedroom any day. It is dreamy! OK, that is just LOVELY! And the way the chandelier is reflected in the mirror is just perfection. GREAT job … it looks just as nice as your inspiration room. Love it to bits! It is BEAUTIFUL!!! I love it. What a transformation on a budget. I think you should paint the dresser. either the wall color or the same color as the other dresser. I think it would make it really stand out next to the brick wall (which is awesome by the way). I love it! You did an awesome job on this room! It looks so relaxing. LOVE everything you did – the color combo is great, completely brightened the room! And score on your awesome deals!!! You bedroom is so beautiful and the perfect place for sweet dreams. I loved viewing this post! The bedroom is so inviting and warm and cozy! Just the right amount of accessories and "pop". Ok…I need to go wipe up my drool. I have some really ugly stuff at my home and I have some really ugly dressers. Although I have considered painting some furniture items, there are times I like the warmth of wood . Plus I am storing stuff for my youngest son (ugh)…but anywho your post is inspirational!! I love how it turned out. I'm in the midst of doing our master bedroom too. I hope I love mine as much as you love yours! I feel the same way about Bahr paint… hate it! The whole room looks lovely…love the brick wall! and the draperies! and the pillows! Great job! Awesome!!! I need tips on how to choose a theme for a room. Also, on how to redecorate a living room on a budget. My husband and I have been married for 10 years and haven't changed a thing; we need to redo every room. Thanks for the head-start on the bedroom!! I already purchased our new bedspread and will build around that. Also, I think you should paint the dresser to match the baby blue walls! What a beautiful bedroom! Mine needs SO much help. This is nice inspiration. 🙂 I LOVE your brick wall, and I agree with Craftify; I think your wall color against the brick would be fantastic. Outstanding job! I think you're right…a picture for inspiration is the way to go! I usually just have a blurry picture in my head! Thanks for sharing. You have done an AMAZING job on that room AND without spending a fortune! I LOVE it! I know you will choose a great color for that other dresser. Maybe the color of your blue walls with a brown stain to age? Or same as your cream dresser would be beautiful. Can't wait to see what you decide. Those lamps are great! What is this Christmas store you speak of?! I cannot get enough of that brick wall. Maybe for the dresser, the body painted a creamy white and the top stained something deep, like walnut? You did wonderful, Beth. It's beautiful. Each of your bedroom makeovers got better and better and this is the best. I can't believe how much it looks like your inspiration pictures. Nicely done!! It's a wonderful re-do Beth and I can see why you fell in love with that inspirational pic. All of your steps in getting there were fun to read about and the other pieces, (especially that dresser you re-did) are fabulous! A wonderful, inspirational post, Beth! Your room looks absolutely lovely, and it's neat to read about how you brought your vision to life without spending much money. Way to go! Beth, I like your master bedroom better than your inspiration photo! I think the pine dresser would look great in a soft white, almost creme paint that is distressed. Great job! Can you come live with me for a month or two? Beautiful, beautiful!! Your creativity and out-of-the-box thinking are so amazing. Here's an example of why I follow you: using part of a crib bumper as a throw pillow!!! you did such amazing job! can i offer a suggestion? i think the two dressers would look great in the same color and i think the white would look great against the brick wall. Oh wow!! It's gorgeous!! I love it!! Thank you for this, you covered all the bases!